eBay PaymentDelivery detailsTerms of salesAbout usContact us Store category Other3mm Bicone beads4mm Bicone beadsSeed bead / loose beadsRibbonDoll clothesNoosa Chunk ButtonNepal BraceletBracelet Sign Up Now ! 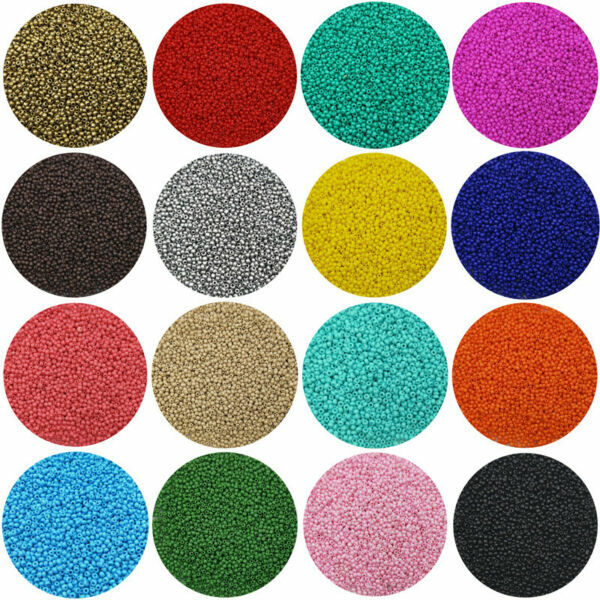 You may also like Lot of 2500pcs Economical 11/0 Rocaille 1.8mm Small Round Glass Seed Beads DIY Product Description Condition: Brand new.Color: U pick colorQuantity: about 2500pcs. (22 gram bag)Size: 1.8mm (11/0)Hole Size：1mmMaterial: Glass Choose your color using the drop down menu at the top. Payment Delivery details Terms of sales About us Contact us Payment We accept the following forms of payment. 1.Payment must be received within 7 business days of auction closing.. 2.We ship to ebay's address only. Please make sure your address in EBAY is matched with your shipping address before you pay. All major credit cards are accepted through secure payment processor PayPal. 3. TOTAL AMOUNT DUE includes the final auction price plus S&H (Shipping and Handling). 4. S&H will be determined based upon the ship to address. PLEASE NOTE: S&H DOES NOT INCLUDE DUTIES, LOCATL TAXES OR ANY OTHER IMPORTATION FEES. Delivery details We are not responsible for any custom duty or import tax Items will be shipped within 2 business day on payment received. Items are shipped from using Airmail ï¼Œreach most of the countries within 10 to 25 business days usually. Delivery time depends on destination and other factors; it may takes up to 25 business days. Country Delivery Time Working Days (not including holiday) 5-7 8-11 12-14 15-19 20-22 >25 Working Days + Saturday + Sunday 5-9 10-15 16-20 21-25 26-30 >35 United States Rate (item arrived) 5 .1% 50.1% 29.6% 10.5% 4.7% Refund United Kingdom Rate (item arrived) 9.9% 63.2% 19.1% 3.4% 4.4% Refund Australia Rate (item arrived) 21.4% 50.0% 14.3% 7.2% 7.1% Refund France Rate (item arrived) 10.5% 28.6% 43.8% 10.1% 7.0% Refund Germany Rate (item arrived) 11.1% 22.2% 30.3% 20.9% 15.5% Refund Canada Rate (item arrived) 0.0% 47.1% 31.4% 17.6% 3.9% Refund Spain Rate (item arrived) 3.5% 25.0% 47.9% 12.9% 10.7% Refund Terms of sales Return Policy : 1. You have 7 days to contact us and 14 days to return it from the date it was received. 2. All returned items have specific reason for the return, and your eBay ID. 3. We will refund YOUR FULL WINNING BID AMOUNT, upon receipt of the item in its original condition and packaging with all components and accessories included, AFTER BOTH Buyer and Seller cancel the transaction from eBay. About us We maintain high standards of excellence and strive for 100% customer satisfaction! Positive Feedback is very important to us. We request that you contact us immediately BEFORE you give us neutral or negative feedback, so that we can satisfactorily address your concerns. Contact us Welcome to our store! Condition: Brand new. Color: U pick color Quantity: about 2500pcs. (22 gram bag) Size: 1.8mm (11/0) Hole Size：1mm Material: Glass Choose your color using the drop down menu at the top.